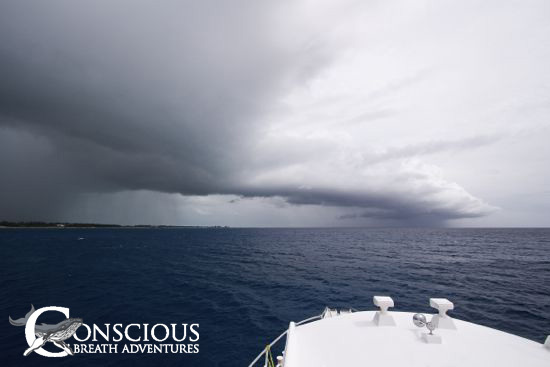 Our third and final week in the Bahamas started on the rainy but warm afternoon of July 13th with guests boarding the M/V Carib Dancer in West End, Grand Bahama Island before cruising north along the western edge of the Little Bahama Bank toward the White Sand Ridge. We were joined by a full boat of repeat guests hailing from the UK, Belgium, California, Maryland and Connecticut as well as our youngest dolphin swimmer of the season at age 6! Today commenced with another beautiful dive and snorkel session on Hogfish Reef. Everyone, even our youngest snorkeler, enjoyed the sharks that frequent this reef. After lunch and a short cruise north, the Bank gave us what we were looking for when we located a pod of over a dozen bottlenose dolphin (Tursiops truncatus) actively crater feeding in calm, clear water. The pod was content to let our swimmers watch as they used their highly refined echolocation to hunt for razorfish (Xyrichtys novacula) buried in the sand, and they checked us out closely when they surfaced for air. 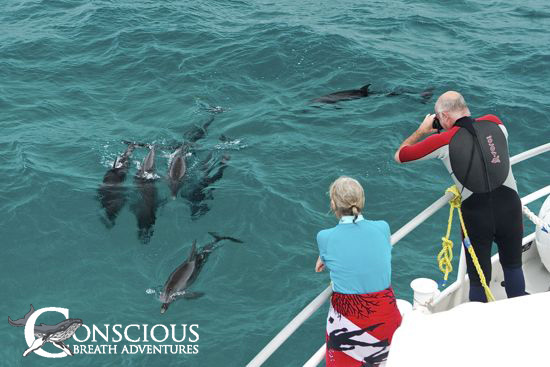 It was a fantastic extended interaction with a wonderful group of wild dolphins engaging in their natural behavior. 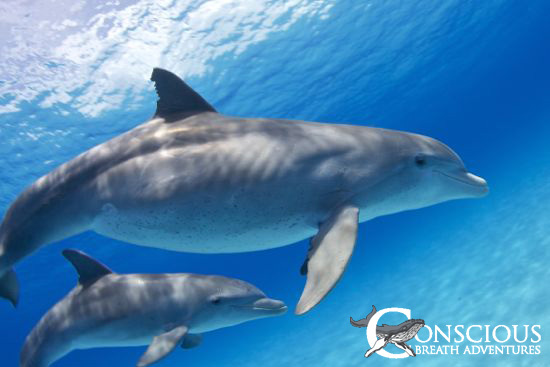 Although it did not happen on this day, is not unusual to see spotted and bottlenose dolphin intermixing and sometimes engaging in sexual behaviors. The possibility of hybrid offspring has been conjectured and we had a bit of compelling visual evidence to support the theory as one of the large female dolphin in the pod had the form of a bottlenose and some of the markings of a spotted dolphin along her flank (below). She certainly looked like she could be such a hybrid! 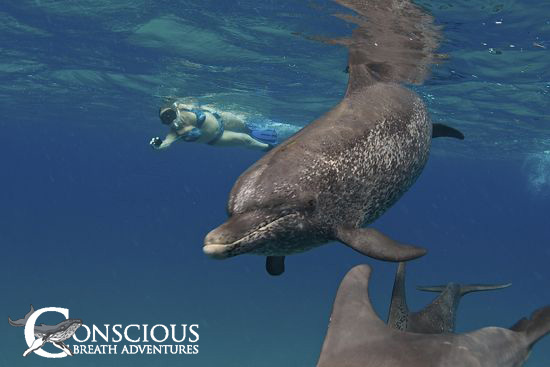 As much as we love the bottlenose dolphins, our focus of these Bahamas cruises are the spotted dolphins. 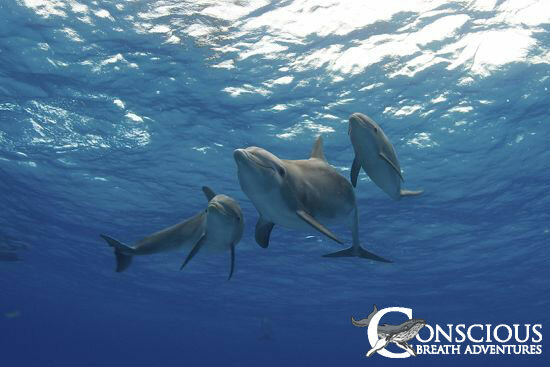 As we were now at the end of two full days on the water without sighting even one spotted dolphin, the decision was made to relocate overnight to Bimini, more than 80 nautical miles to the south, another area where spotted dolphins reside and where we had successful interactions the week before. Possible spotted dolphin/bottlenose dolphin hybrid? The day broke with lingering clouds and scattered showers, but conditions were fine to start the daily adventure with a snorkel and dive on the famous, mysterious Bimini Road, also known as the Road to Atlantis. 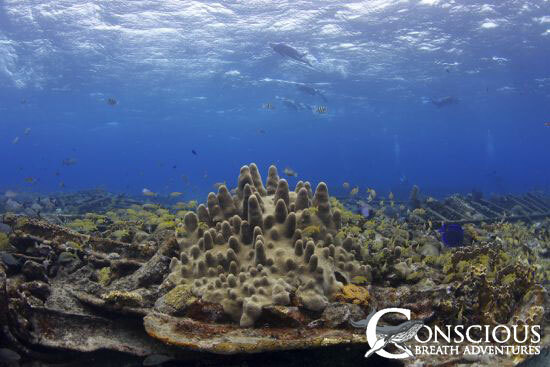 This ancient underwater geometric rock formation has been the center of controversy, research and new-age philosophies over the years but we just know that it is a shallow reef with profuse marine life and it is always a fun place to get wet. 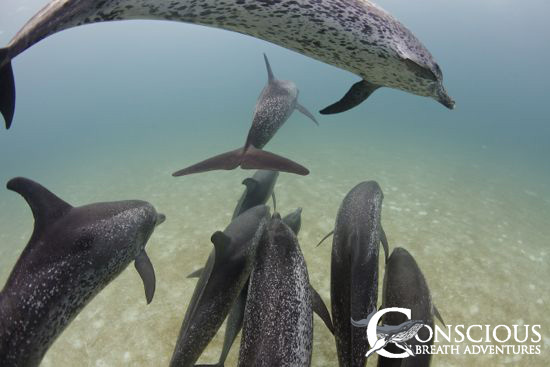 In the afternoon we got what we were looking for when we located a large pod of spotted dolphins and for more than an hour had an exciting and energetic interaction with dolphins young and old. Several swirling groups of 4-8 dolphin swan into, through and all around our swimmers, sometimes amassing into larger pods of nearly two dozen dolphins that left everyone exhausted, winded and grinning ear to ear before the sun slipped down toward the horizon. 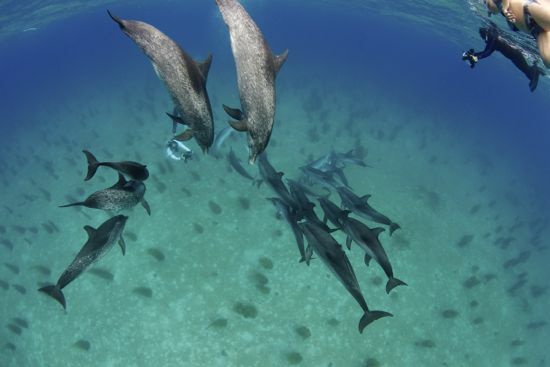 Our last dolphin day began with calm seas and a pleasant ride out to the wreck of the Hesperus, a small tugboat that sank in less than 20’ of water to the northeast of Bimini. This wreck is a magnet for teeming schools of grunts, barracuda, crawling conch and southern stingray, earning it the nickname of Stingray Wreck. 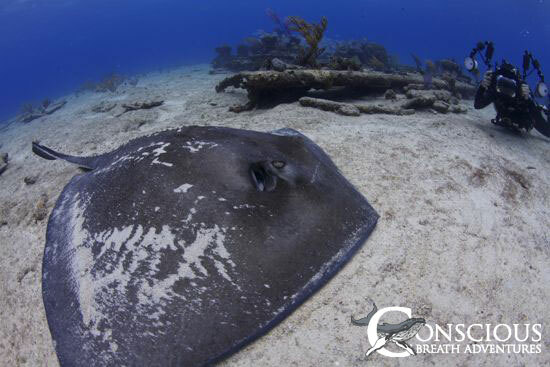 The Hesperus is conveniently located on the edge of the Bimini dolphin grounds so after finishing our dives there it was and slow and easy cruise over lunch in search of the dolphins one last time. Happily, our luck held true and we relocated many of the same pod of spotted dolphins from yesterday afternoon, with similar happy results. In spite of the the challenges from earlier in the week, everyone loves a strong finish and the happy memories from another successful adventure.